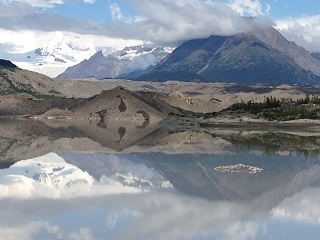 I am writing this along the banks of Jack Creek deep inside Wrangell St Elias National Park…in Alaska! It has again been a long time since you have heard from me. When I arrived back in the Bay Area in May, wet and wobbly from my misadventure in Costa Rica, my only instinct was to keep moving, hoping that the momentum of putting one foot in front of the other would keep me from collapsing into a heap of self-pity. 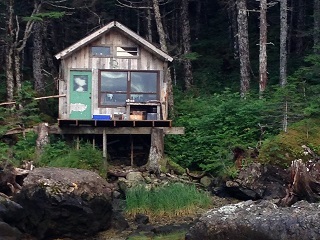 So I pivoted 180 degrees and stepped north, back to Alaska, the land of wilderness and adventure. I threw my tent and sleeping bag in the trunk, dusted off my ice chest and thermos, made a run to Trader Joe’s for dried fruit and energy bars and hit the road. Daisy was first in line for the ferry in Bellingham, so I was able to snuggle her into a sweet spot in the rear corner of the car deck. 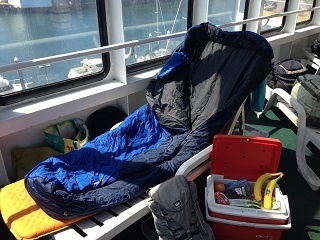 I didn’t pay for a cabin; instead I did what the locals do: I grabbed a lounge chair and set up my “camp” by the window on the open-air solarium deck for our three-day journey through the Inside Passage. 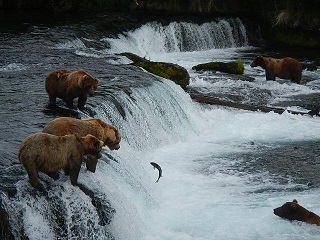 I really didn’t have much of a plan for what I was going to do once I landed in Alaska. If I had any expectation at all, it was that I would wander the back roads, allowing the solitude to wash away my sorrows as I headed as deep into the wilderness as Daisy could go. Well. It hasn’t quite turned out that way. Before the ferry set sail from Bellingham, I sent out a few quick emails letting folks know I was heading north. 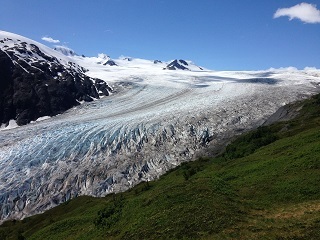 By the time I regained connectivity when the ferry docked in Alaska, my inbox held numerous invitations to join adventures all over the state. In Haines, where I got off the ferry, I was invited to sleep on the floor of a retired public interest attorney turned rafting guide. Instead of eating canned chicken in a campground on my first night, I found myself sharing a meal of halibut chowder, seasoned with local gossip and laughter. On a hike up a mountain the next day, I was adopted by two men and their dog half way up the trail. I am sure it was partly because it’s not very smart to be hiking alone in bear country when the blueberries are ripe, but mostly it was because folks are just down-right nice here. They can’t imagine someone wanting to be alone on a warm, brilliantly blue, summer day. There is way too much opportunity to be alone when the dark skies and deep snows of winter set in. Never in my wildest dreams had I imagined I would be in any of these places, doing any of these things! 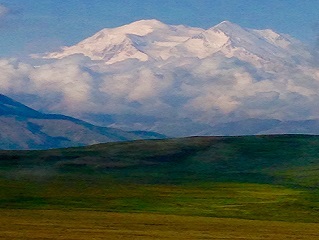 The only thing that was missing from the trip was the solitude in wilderness that I had originally come north for. With all the adventures, the travel, and the talking, I had barely had any time to count my blessings or to put pen to paper. After the rafting trip, I was determined to find a spot to myself. 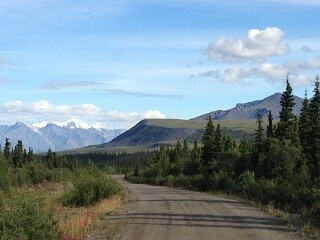 Which is how I ended up here, 40 miles inside Wrangell St. Elias National Park: I turned Daisy down a dirt road. The other visitors stopped at the established campground before the first stream crossing. But the ranger there was a kindred spirit. She could tell by the look in my eyes that a campground with a bunch of other people, next to a grass airstrip and a ramshackle, rowdy, backwoods bar wasn’t what I was after. She told me about this spot twently miles farther down the road, nestled in between lazy Jack Creek and towering Skookum Volcano. She could see Daisy’s spirit too, and assured me that Daisy could make it over the three streams we had to ford to get here, and the ranger was right: Daisy sailed right through. Here I sit in the sun, pen in hand. Alone for the first time on this trip, except for the beaver working on his dam in the evenings and the owl in the tree hooting above my tent every night. I am content and happy, and very, very glad to finally be sharing this adventure with you. This blog isn’t meant to be a travel log. I usually try to tell a good story laced with a bit of my philosophy. I don’t really have a philosophy to share this time, unless it is the lesson that I have learned these last few weeks: life often gives you what you need, not necessarily what you want. 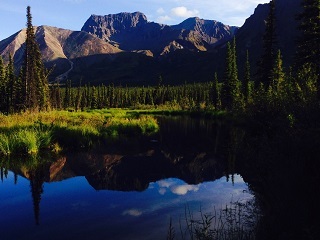 When I came to Alaska, I wanted time alone. What I got was the companionship of countless remarkable people. Their kindness kept me smiling and their adventures kept me busy.